Toast the bread, generously butter on one side and then cut into 6-8 pieces each. 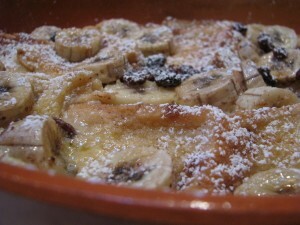 Scatter the bread in a large microwave proof dish, butter side up and scatter the banana on top. In a large bowl/jug, whisk the milk, 85g brown sugar, cinnamon and the eggs until well incorporated. Mix the cornflour with a little of the milk mixture. Add this back to the large bowl/jug, whisk well and then pour over the banana. Flatten the top a little with the back of a spoon, sprinkle with a little more brown sugar and cook in the microwave on high for 8-12 mins, uncovered. Remove and rest for a minute or so before dusting with icing sugar if you like and serving in individual bowls with a good dollop of cream on top.